Zebra’s GX™ Series and ZD500™ printers pair the fastest print speeds with the most complete feature set of our desktop printer lineup. Innovative label, receipt and tag-handling capabilities enable the flexibility you need. 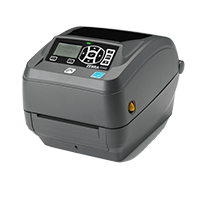 Offering top print quality and a variety of connectivity options, the GX420™, GX430™ and ZD500 printers support the widest range of applications and can be integrated into almost any environment so that you can improve efficiency and profitability, save time and reduce operator training.